Week End Blog – Yellen to the rescue! This week started in the same fashion as the last one ended. Greek presidential elections, falling oil prices, and a collapsing ruble dragged equity markets down globally. 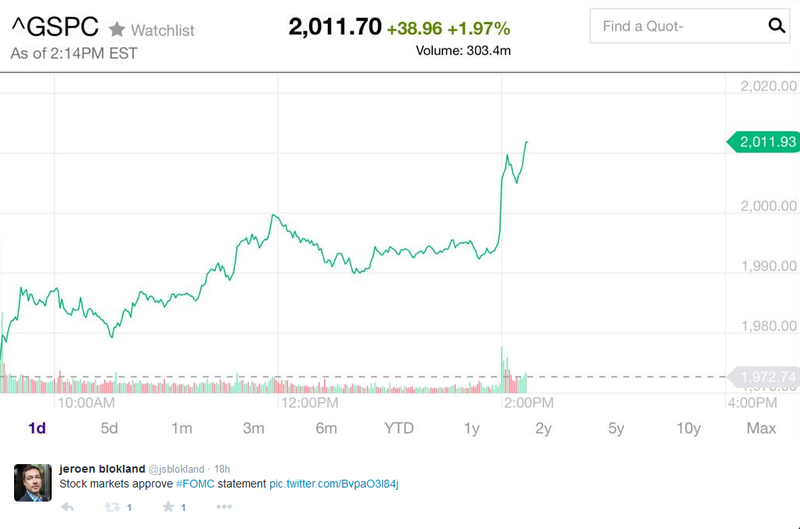 But, on Wednesday, Janet Yellen came to the rescue,…again. The Chairwoman of the Federal Reserve delivered a dovish statement that was well received by markets. Fed statements have always been somewhat of wording game and to keep in the phrase ‘considerable time’ probably did it. There is reasonable possibility that Yellen will sound more dovish for longer. Although she emphasized, in the press conference following the FOMC statement, that current developments in financial markets (especially those related to energy prices), did not alter the governors line of thinking about monetary policy going forward, inflation expectations could surprise on the downside. 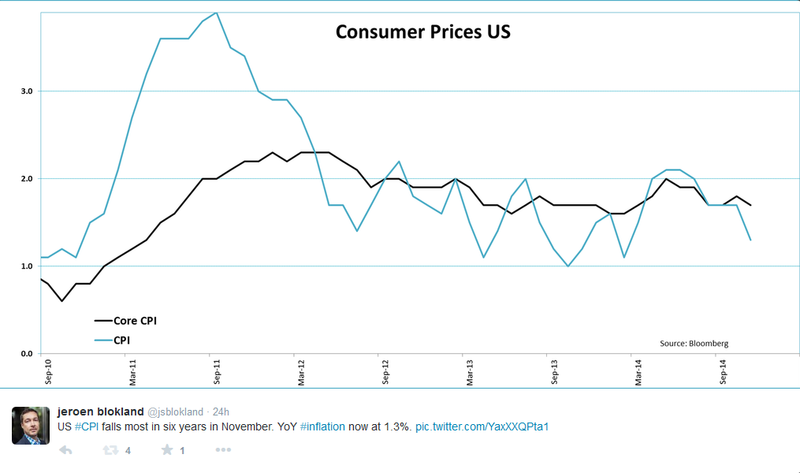 Headline consumer prices were up just 1.3% YoY in November. Core CPI came in at a little bit higher at 1.7%, but also below the Fed target. And there are strong signals that, at least in the short-term, inflation levels could go down further. The Billion Prices Project for one is pointing to an inflation level of around 1.0% in the coming months. Yellen described lower CPI levels as transitory, but my hunch is that low inflation could be among us just a bit longer than the Fed is currently expecting. 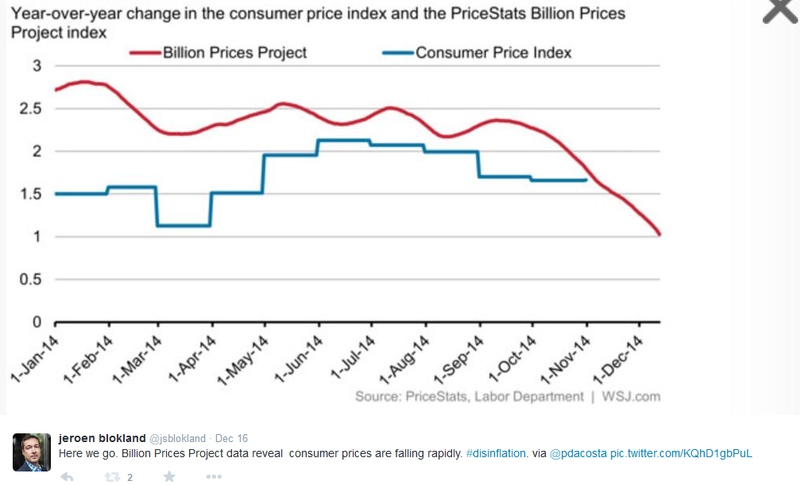 Lower oil prices are, of course, the biggest force that will drag down consumer prices going forward. 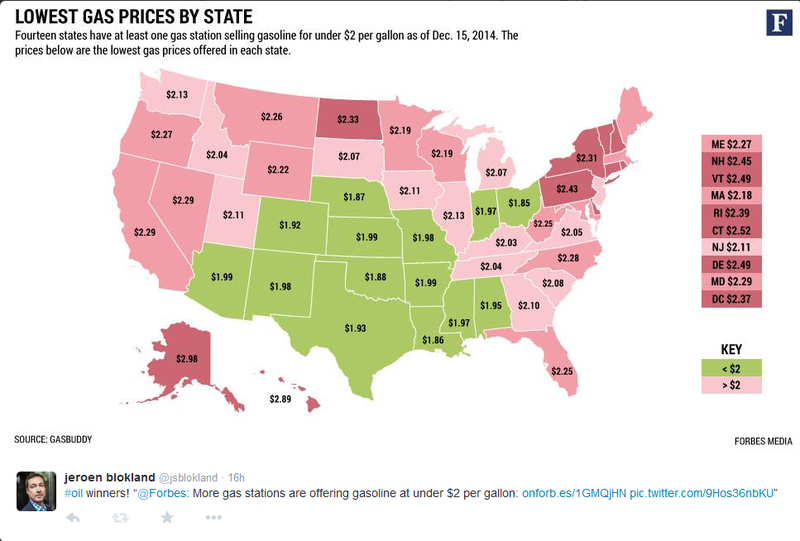 This week Forbes put this cool map on its Twitter timeline, showing the increasing number of US states with gas stations offering gasoline under $2 per gallon. 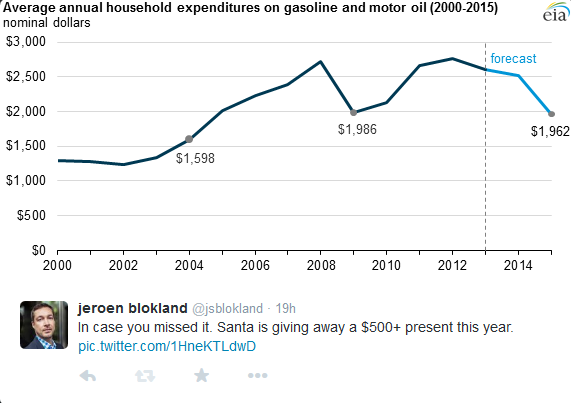 As mentioned before the lower gas prices will have a profound impact on consumer spending power. With current gas prices the average household will save over $ 500 next year on fuel. Now that’s what I call a Christmas gift. Now for the ugly part of the week. The ruble again took center stage. Two days of massive losses on Monday and Tuesday. 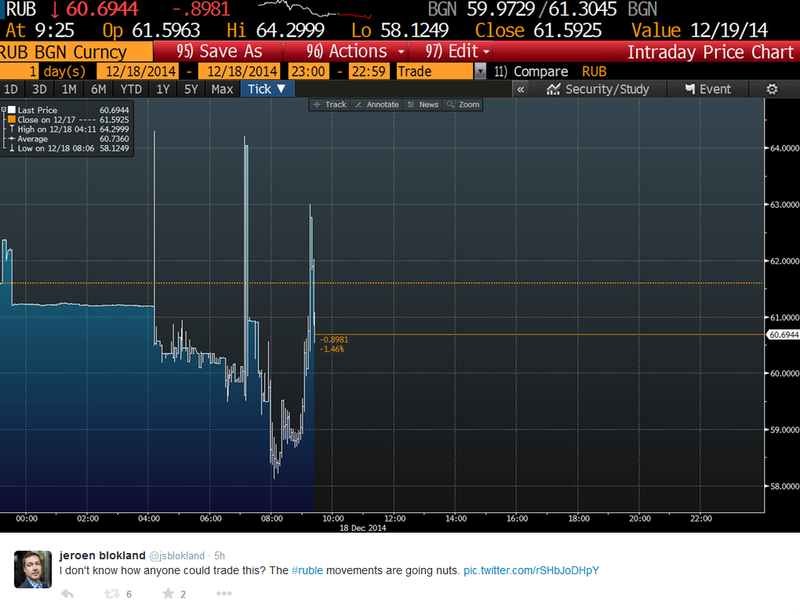 At one point the ruble weakened 36%(!) in less that 36 hours. Based on the hostile movements in recent weeks, the ruble is now way more risky than equities. Only bitcoin can compete with this kind of volatility level. 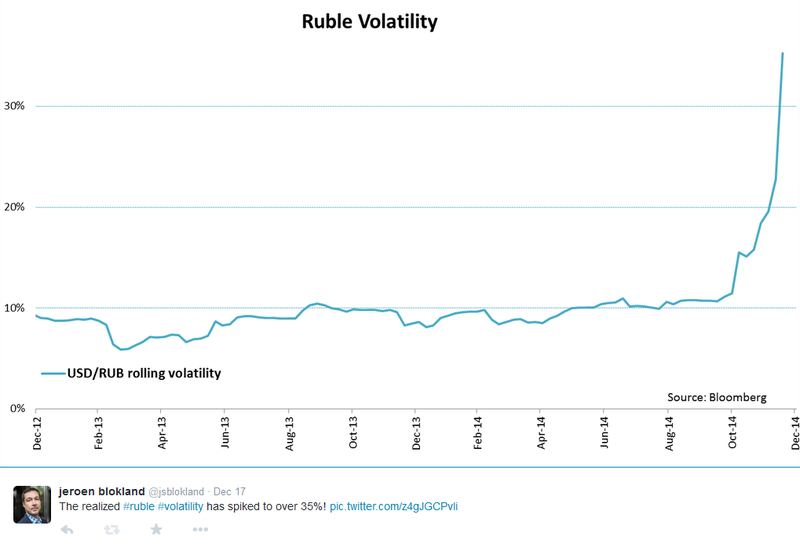 The ruble movements were so extreme that they forced the Russian Central Bank to step in. 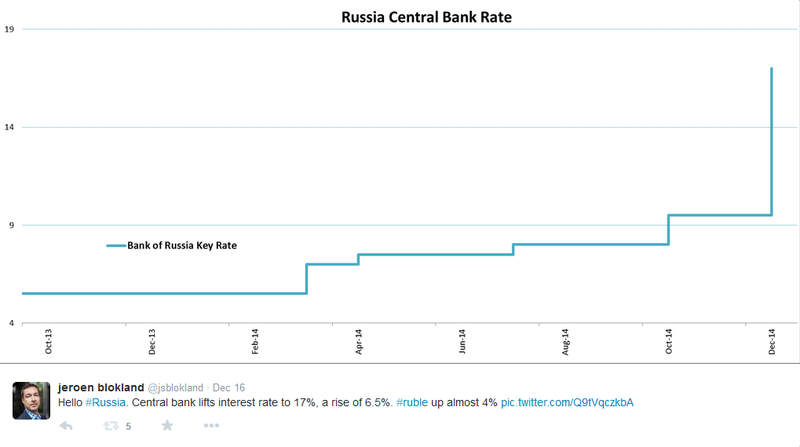 In an attempt to stop the depreciation of the Russian currency the central bank raised the interest rate by a whopping (always liked that word) 6.5% to 17%. Although it did not pay off immediately, the currency did stabilize somewhat after Russia also announced it will use its currency reserves to protect the ruble. Well, stabilizing is perhaps not the right word to describe what happend in the days after, as this ruble graph from Thursday shows, but it stopped the massive decline. But the volatility stays for now. 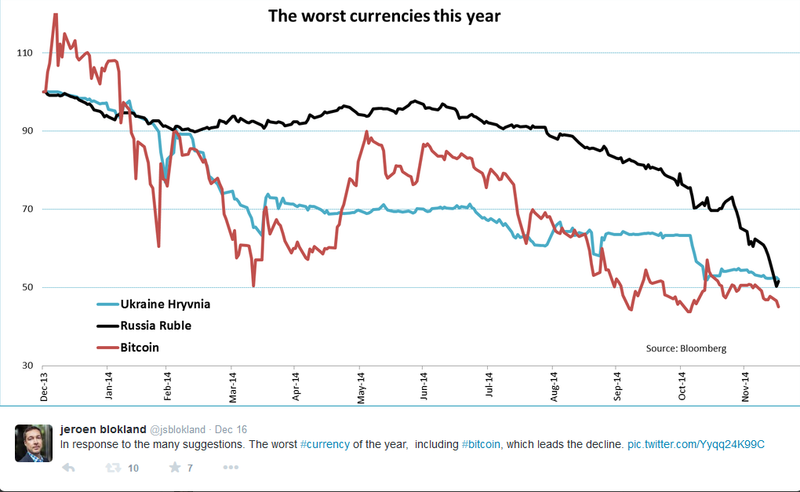 This week I sent out this graph showing that the ruble was heading for the top spot on the list of the worst currencies of 2014. 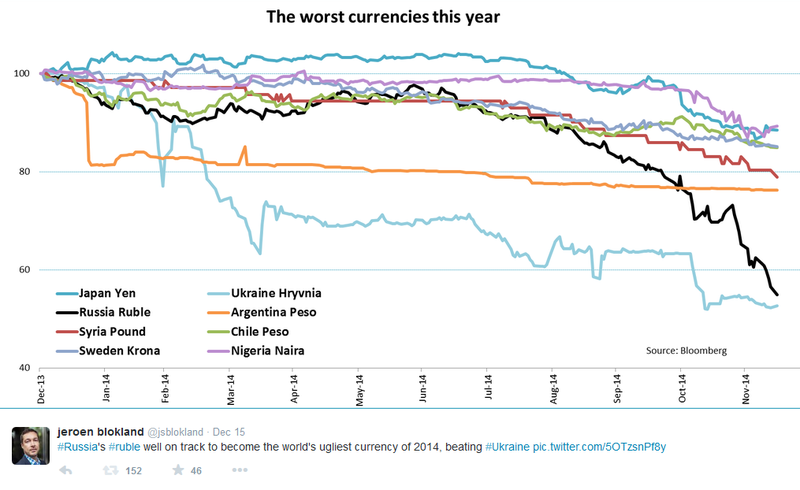 Ironically, it has only the Ukrainian hryvnia as it last competitor for the title. While the ruble is in a fight to become the worst currency of 2014, other emerging currencies are no doing all that well, either. The Indonesian Rupiah and the Turkish Lira are just two examples of EM currencies that are also hit hard. From a longer-term perspective things look even worse. 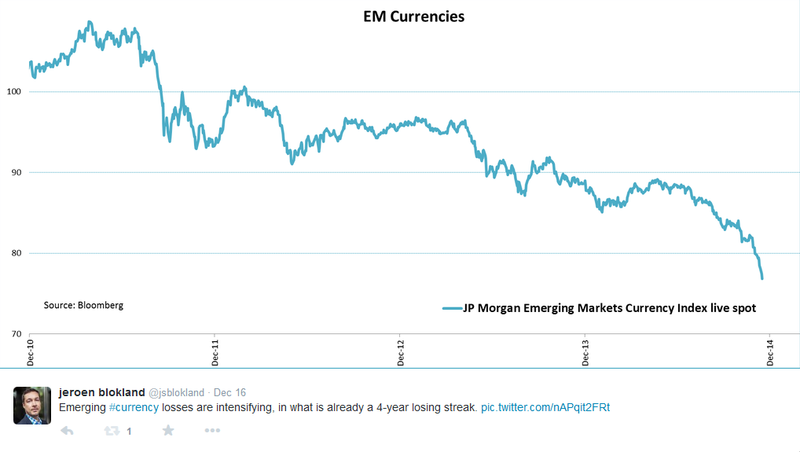 On average EM currencies have been going down for four years now. Time to move over to oil. Oil continued its slide downwards, although it did claw back a little after the Yellen speech. 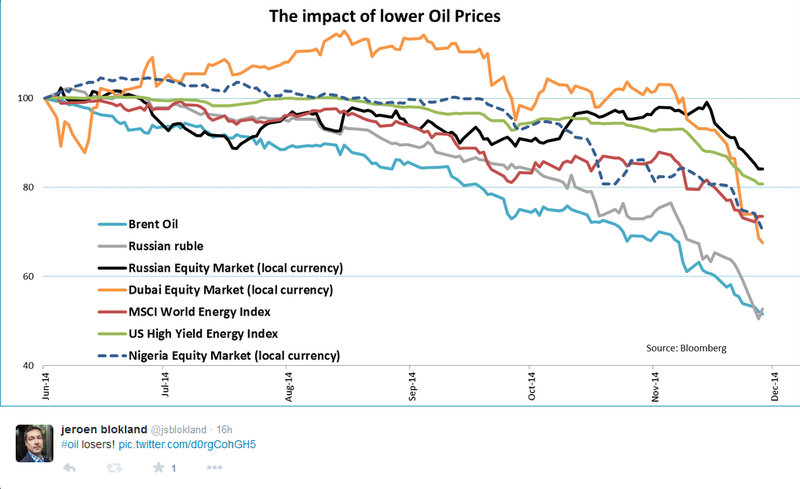 The graph below shows some of the biggest losers of collapsing oil prices. Yes, the ruble is again in the lead, but high yield energy companies, Dubai stocks, Nigerian stocks and Energy stocks in general are also doing poorly. Perhaps it’s better to switch to solar. 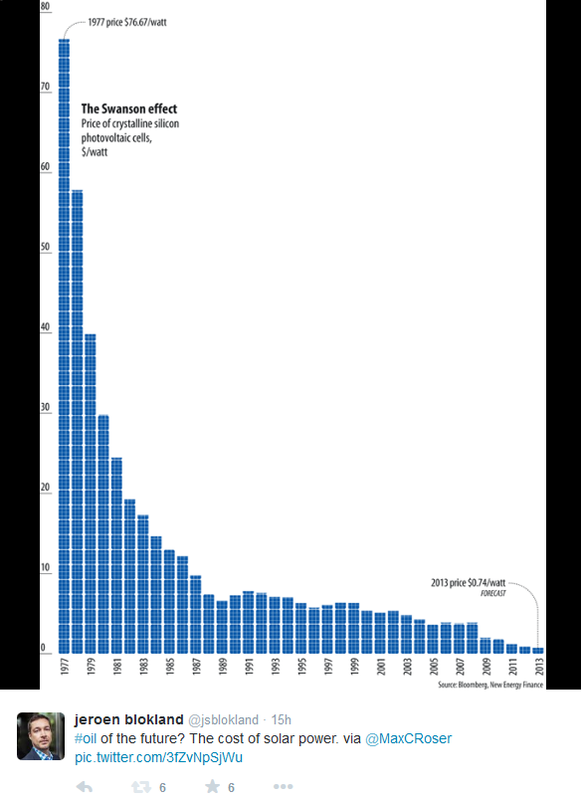 Solar energy is getting cheaper all the time. One market managed to dodge all the tensions in financial market this week. The Chinese equity market is on fire. Stock have risen almost 50% since August. But the bad news is that it’s hard to explain this rally with fundamentals. The Chinese are moving out of the housing market, into the stock market, with little attention for macro or earnings data. 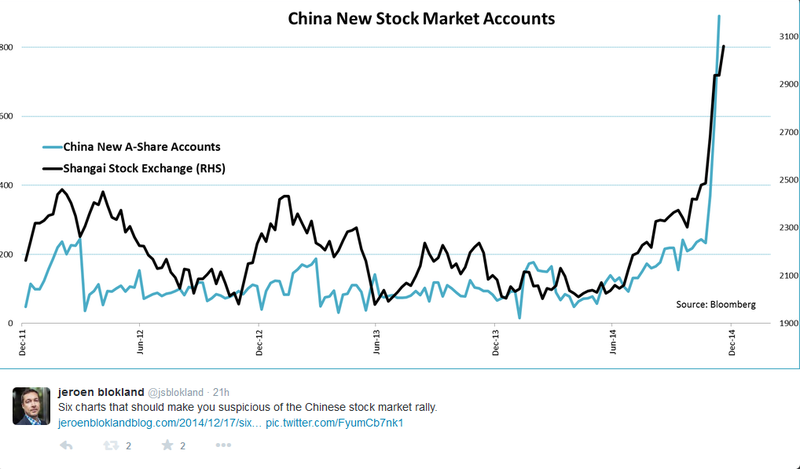 In a blog I posted this week I show six graphs that should make you at least a little suspicious of the Chinese equity market rally. Thanks again for reading the Week End Blog. Enjoy your weekend!